If you’re pondering a career in the industry, you’ll be eager to learn more prior to landing that first big role. To provide some authentic insight into the daily routine of a qualified coder, we’ve invited our very own Aaron McGuire to run through his schedule. 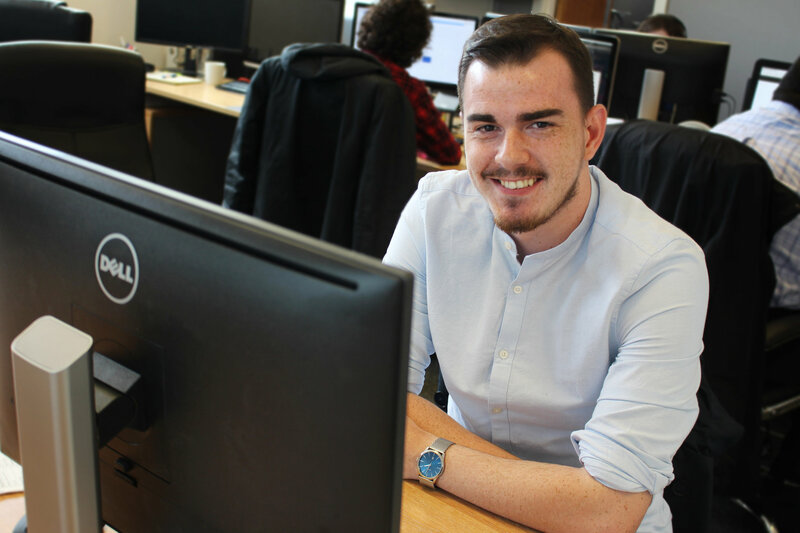 Aaron joined Pixel Kicks in 2017 following outstanding BSc Website Development results from Manchester Metropolitan University. Here’s what he gets up to. I always aim to get into the office before our 9:00am What’s the Story? catch-up. Our office is dominated by Oasis fans and the meeting takes it’s name from their second album! Having that extra fifteen minutes beforehand gives me an opportunity to collect my thoughts, scan through my emails and ideally start my day with a completely empty inbox. By having this time to run through emails and instant messages, I can make a note of anything major that requires immediate attention – this can then be flagged in due course. Time permitting, I will then have a browse of Muzli. This is InVision’s expertly curated design inspiration. I strongly recommend subscribing to the Muzli email digest; this weekly summary of popular and inspiring design content can really go a long way towards igniting your creative side, especially at this time of the day! What’s the Story? 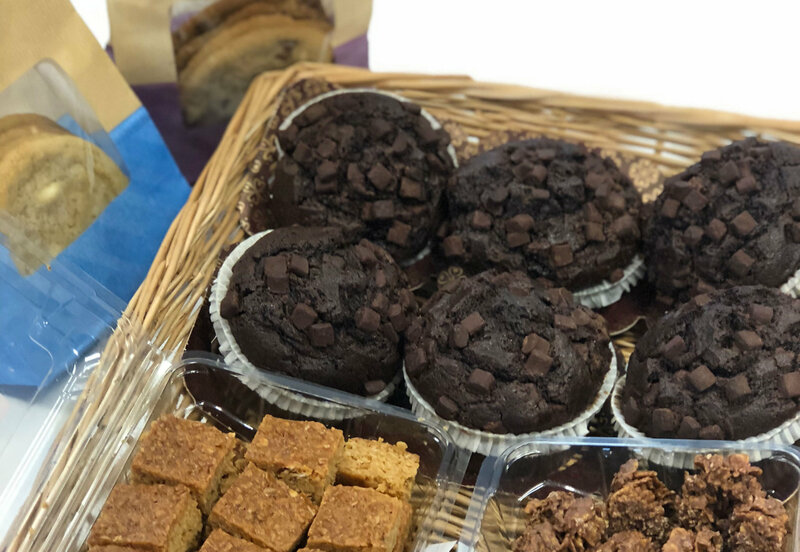 is often accompanied by a selection of pastries, homemade smoothies and special brewed coffee to really get us set up for the day. 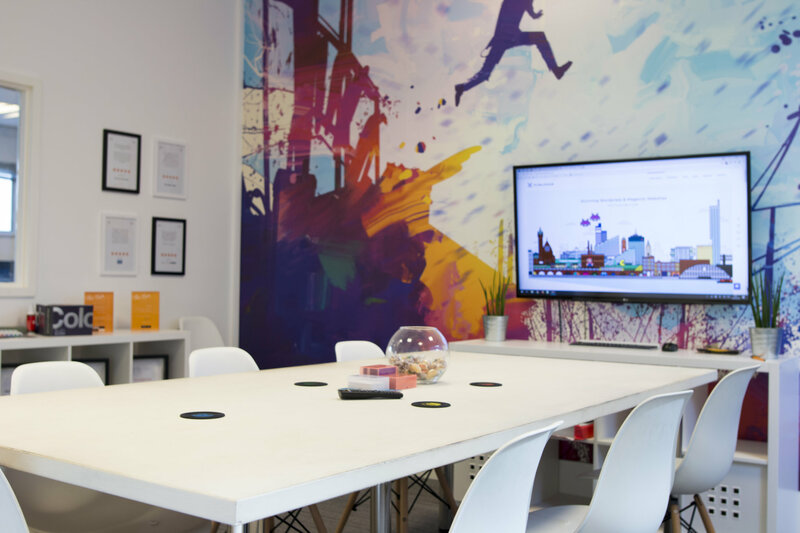 The meeting usually lasts around half an hour and we all discuss what we have planned for the day – the web team, digital marketing team and project & account managers are all present. This allows us to ensure that we’re on track with all of our work as a team, and helps us to plan ahead for the rest of the week. It also gives us a chance to raise any development issues that we may be having on our projects (a bit like rubber duck debugging, minus the duck). 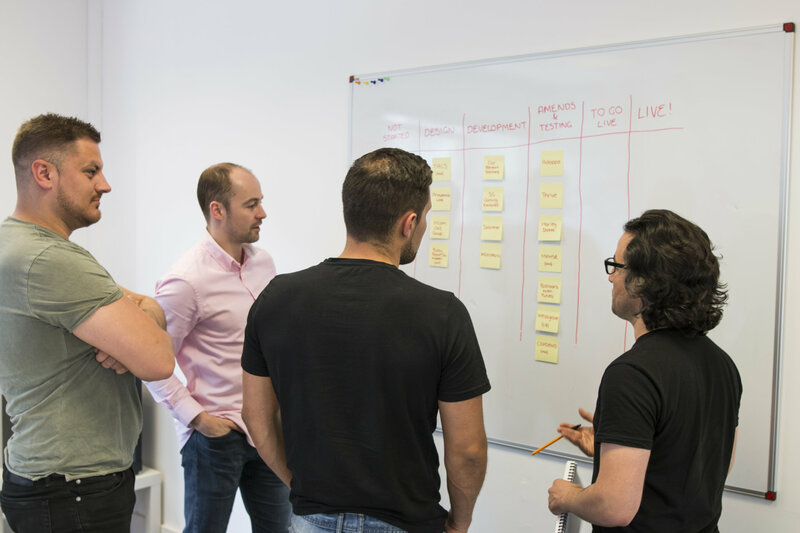 It’s also during these meetings that we’ll take a look at our project board, to see if we’re able to move any of our websites to the next stage – whether that be development, testing or ready to go live. Following the catch-up, my next step is to check Trello. Trello is a widely industry recognised project management tool, which allows you to keep track of changes to jobs and prioritise your workflow. Essentially, it’s an advanced to-do list that allows the whole team be kept fully in the loop about everything, enabling us to work efficiently and accurately update clients. We check Trello each morning to see what tasks we have to work through today, and once complete we mark them as done, and can leave a little update with some details. These tasks, or cards as they’re known on Trello, work almost like milestones for each web project. Once you have completed the card you know that section of the website is complete, and you can move onto another part – the idea being that larger scale projects are broken down into smaller tasks to keep a much more accurate time scale. On top of all of this, Trello uses a colour coded priority system, making it easier for us to start at the most important tasks, and work our way down. Some days I might be needed to go into any meetings where a developer is required to talk about the more technical aspects of a website build, or answer general questions on best practices/the most efficient way to achieve something. So, I’ll usually plan my workload around those meeting times. At this point, we’re all usually fully up to date with how projects are going, and what we need to be working on today. As you’d expect, the tasks that lie ahead are largely dependent upon the projects and our progress. If we are starting a new website build we load up the command line and pull in our bespoke starter files. 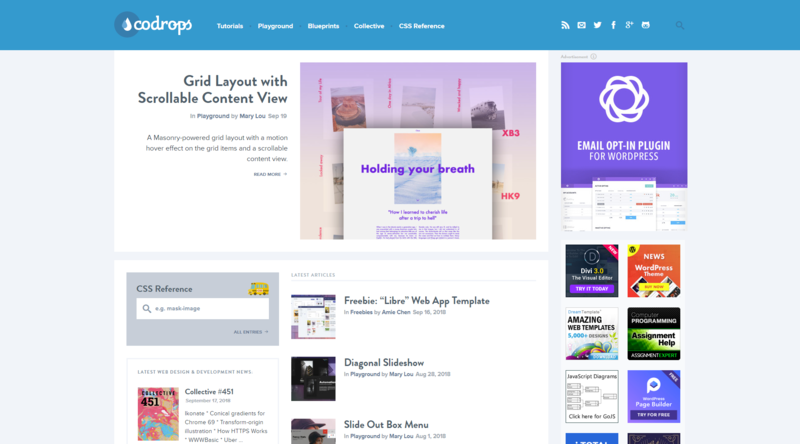 These are essentially a series of custom developed scripts built and maintained by the web team and hosted on Github, ranging from optimisation scripts to our gulp workflow. Our custom-built scripts allow our file structure to be the same across all of our projects in case one developer needs to jump on a project they aren’t familiar with. If we are working on an existing project we simply drag our project folder into VS-Code and run our watch tasks from the terminal for code compiling. The work through my to-do list continues. I’m sure to leave progress updates on internal documents, or on the relevant Trello cards for my tasks. Keeping our Project Manager informed is, of course, an essential process for our Development team at Pixel Kicks – but on a personal note, it helps to read back through progress updates to track what I’ve done. We use Harvest to track our time, and while it’s a habit I’ve had to acquire over time, it’s really advantageous in terms of reflecting on my productivity. This is when we take our lunch hour, and while we all do something different, I head off around Manchester to pick up something quick. Back in the office, we all do different things to take a proper break from work. Some of us crack open a Netflix box set, while others stay at their desks and listen to music. We’re also an office of gamers, so we often switch on the Xbox for a game of Call of Duty or FIFA, or play something on our PCs. We’ve even got an old-style Super Nintendo console for when we fancy going retro. Straight after lunch, we always have a project catch-up to make sure progress is being made and we’re all on track according to where we’d planned to be in the morning meeting. This is also a good time to check that no other important jobs have come in during the day that take priority over tasks currently being done. The afternoon catch-up is usually nice and brief, so we can all get back to our desks and the first thing I’ll do is reply to any emails that might have come in. I’ll then have a quick Trello check, ticking off any tasks that have been completed, before continuing with what I was working on before lunch. As I enter the final hour of the day, I make sure I’m completely up to date with everything, checking there’s no high priority work I’ve missed, and wrapping up on the work I’ve been carrying out this afternoon. As a web developer, tying up loose ends is an essential end-point. This can sometimes be a bit of a hectic hour, pushing to get things completed before we head home, but other times we can be a bit more relaxed. Specifically, on a Friday, we’ll carry on working while enjoying a beer, and listening to a mix of music chosen by everyone as part of our traditional, weekly “Spotifriday” hour. Every day at Pixel Kicks throws something different at you, and as we continue to grow as a digital agency, we’re constantly working on more interesting, exciting and unique projects. If you’d like to be one of them, get in touch – give us a ring on 0161 713 1700 or send an email to sales@pixelkicks.co.uk. 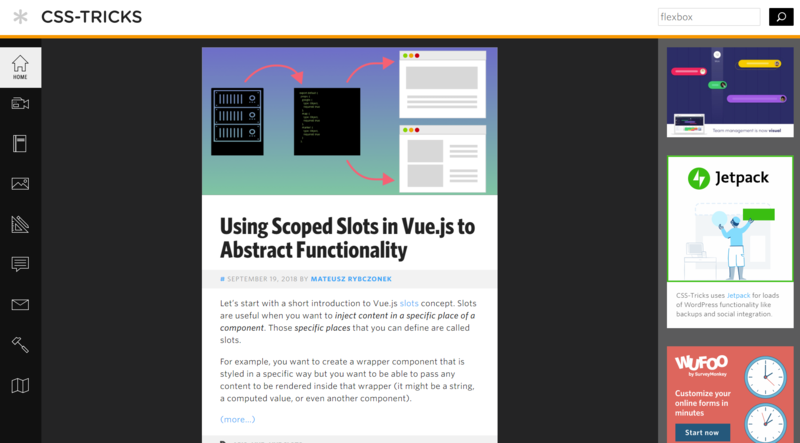 Codrops is a web design and development blog that creates articles and tutorials related to groundbreaking trends and techniques in the industry. It provides designers and developers with an extremely useful resource that inspires them to innovate. It features a handy CSS Reference search bar that empowers users to pull up any blogs relating to a specific part of the language. While CSS-Tricks was founded in 2007 as a resource purely related to CSS, it has grown into a site that curates a wide range of web design and development content. Spend a bit of time checking up on this resource for fantastic insight. CSS-Tricks also features an active, thriving forum for designers and developers to run issues by each other. It can be a source of great guidance for junior workers. 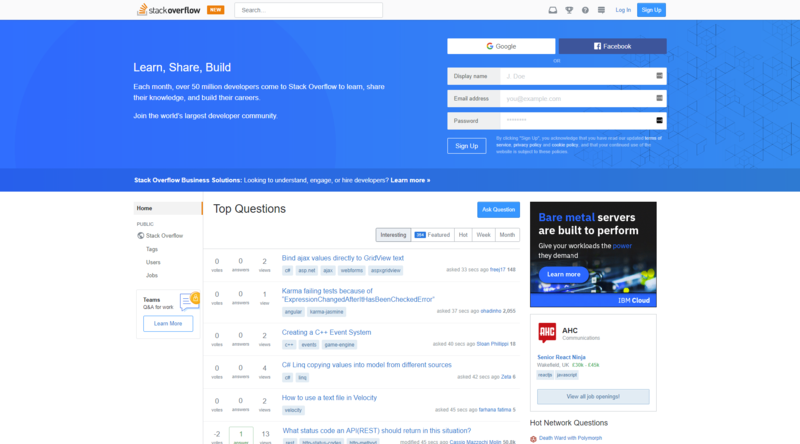 Stack Overflow is arguably the largest developer community on the web. This is the place where developers can learn and share their knowledge with others by posting and answering questions related to the industry. The site also features an upvote system to give greater exposure to thorough answers. You can sign up for free to start getting involved in the conversation.